*This sections details out the steps to configure the forecast models and generate the forecasts for fixed price kind of projects. This sections also explains from where to validate\view the generated forecasts. This feature is parameter controlled and the parameter lies in the Forecast model form. ‘Accrue revenue on fixed price projects’ needs to be turned on to generate forecasts for fixed price projects. 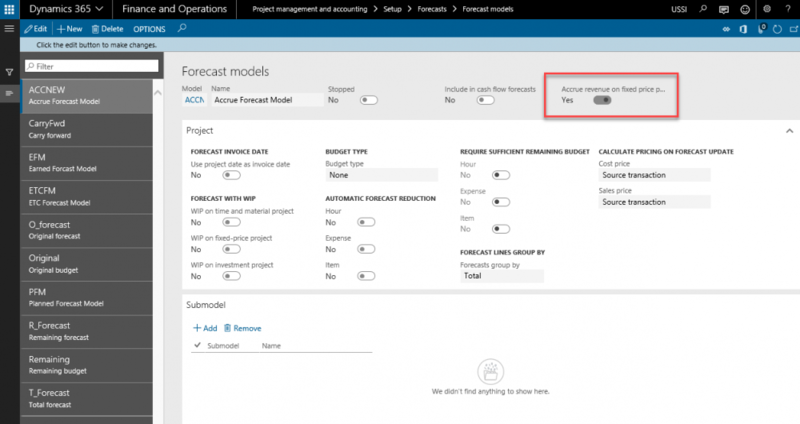 Once the parameter is turned on the forecast model and user creates a forecast line using this forecast model on a fixed price project then the revenue forecast line are automatically generated. To create a new forecast use the below form. Once the forecast lines are created\forecasted on the hour forecast form, an automatic revenue forecast line is created. The revenue line created can be validated on the below form. This feature creates the revenue forecast lines for transactions of hour, expense and item types.